Hi, I am very happy that you are taking the time to read about my dogs and how I raise my puppies. I bought my first golden in 1993 (Keeza) and that began my love of this wonderful breed. I picked him out of a large litter based on the fact he was the fattest—oh how much I have learned :-). My husband asked me once if I would ever pick a puppy that way again and I laughed saying “never again”. That being said, I am so glad Keeza was the one I chose, or should I say, he chose me. I was raised in New Zealand and moved to Canada in 1979, a temporary visit that became permanent. I have special needs twin daughters who were born in 1987 and now live in a supported living home, visiting me often for dog shows and just hanging out with mum. 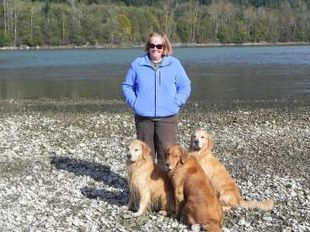 My goldens’ and I live with my wonderful husband (avid golfer). Without my husband’s help and support, Redgold simply wouldn’t exist. In 1995, I was fortunate enough to be leased a female by Charlotte Davis of Glendavis Goldens and with Whisper and Keeza’s litter “Redgold” was born. I kept a puppy out of that litter who I named Vista, after earning several titles and having babies, she retired to Texas to spend the rest of her life hunting with her new owner. Scarlett was purchased from Fyreglo Kennels and she became my foundation female. To learn more about Keeza and Scarlett, please see my "Rainbow Bridge" page. All of our dogs live in the house with us and are a part of our family. Golden Retrievers are people dogs and want and NEED to be with the families that they are living with. They do not do well as outside dogs. Where you are at every moment, is where they want to be. If I am in my office, they sleep on the floor at my feet, watching tv, they are at my feet, cooking, they are sleeping in the kitchen waiting for something good to hit the floor – get the picture? How I evaluate the dogs in my breeding program's is rather complex, but I will explain it as best as I can. First, the dogs must pass all their health clearances (hips, elbows and heart). Then, most importantly, they must exhibit the proper golden temperament. To me, a golden should be a dog that is happily snoozing while you are busy in the house or just relaxing. But, when you pick up a leash or a tennis ball, the dog should be ready to go have some fun and pursue whatever activity you would choose. Their health and temperament are of the utmost importance to me. If the dogs fail in any of the things that I have mentioned above, they will not be part of my breeding program. Lastly, I evaluate them towards their physical soundness in regards to the golden retriever standard. I then plan a breeding that I believe will compliment the dogs so that I am adhering as closely as possible to what the standard calls for in a golden retriever. All of my dogs that are involved in my breeding program are checked for a variety of different health problems that plague the breed. I clear hips and elbows with the OFA (Orthopedic Foundation for animals), I do eye exams with a veterinary ophthalmologist every year and their hearts are cleared by a veterinary cardiologist. These clearances have been done on my dogs for generations and I feel they are very important. I give everyone who gets one of our puppies copies of the parents health record. Temperament is my first priority followed by health, then the ability and desire to compete in all areas of competition (trying to maintain the integrity of a true “multi-purpose” golden). Most of my puppies go to homes as family pets and I keep that in mind when selecting dogs to be bred, ensuring that they are all healthy, easily trainable, calm house dogs WITH A TRUE GOLDEN TEMPERAMENT, never skittish, shy or nervous of people or new situations. A golden should have his tail wagging and be happy, confident and eagerly looking for a treat or something fun to do. All puppies placed by me must be house dogs. I go out of my way to make sure my puppy people have a wonderful experience when buying one of my puppies. Each puppy goes home with a toy and a blanket and a wealth of information. My dogs are inside dogs that sleep on my bed at night (when old enough) and live inside with our family. The decision as to which puppy goes to which home is made by me based on the circumstances of each individual family. I can provide excellent references and offer lifetime breeder support. My puppies are sold on CKC non-breeding agreements and spay/neuter contracts since they are companions/pets and should not be bred. I do guarantee my puppies against crippling hip dysplasia, eye problems that cause blindness and severe SAS. All my puppies are sold with a written agreement and to APPROVED HOMES only. I do keep a waiting list for any litters that we are expecting. Making the move to Castlegar from Chilliwack has been a huge change in our lives and having 2 1/2 acres to live on instead of a tiny lot has been wonderful. Mountain hiking trails abound. It's simply a golden paradise. I have competed in conformation, field, obedience and tracking with my goldens, proving their ability to remain true to the breed standard. My dogs receive regular appropriate exercise to maintain them in hard working condition, which will be also required of anyone who buys a puppy from me. I feel very strongly that the best way for the puppies to be happy and the families to be happy is for their personalities to mesh well. I don't want to see a quieter puppy in a home with 4 young kids. The puppy just isn't going to be what that family is looking for. I also don't want to see a more active puppy with a family that doesn't have children or with "empty nesters". I get to know my puppies very well and they are raised with the other dogs. 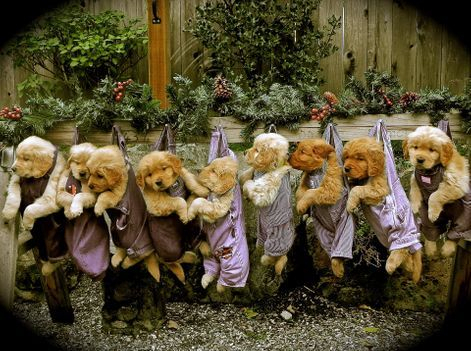 In a litter of pups, the personalities run the gamut and will be quite different just like human siblings. Most of our puppies test out very middle of the road. I take our puppies to a variety of different places in the car, I expose them to a lot of different surfaces (grass, gravel, cement and dirt) and spend a lot of time playing with and handling them. My special needs grown daughters spend a lot of time with them and as you can imagine, our house is the place to be for friends when we have a litter of pups to play with. It is very important that the pups get a good start with me in beginning their socialization so that they are able to realize their full potential as adult dogs.